and into a test tube as a keepsake. but it’s still gloved in shadow. It’s only you who still wants to wear it. 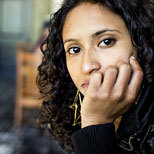 Tarfia Faizullah is the author of Seam (SIU 2014), winner of the Crab Orchard Series in Poetry First Book Award. Her poems appear in Oxford American, American Poetry Review, New England Review, Best New Poets 2013, Poetry Daily, Please Excuse This Poem: 100 Poems for the Next Generation (Viking Penguin, 2015), and elsewhere. Her honors include a Pushcart Prize, Ploughshares Cohen Award, fellowships and scholarships from Kundiman, the Fulbright Foundation, Bread Loaf, Sewanee, Kenyon Review Writers Workshop, and Vermont Studio Center, and other honors. She is the Nicholas Delbanco Professor in Poetry at the University of Michigan Helen Zell Writers’ Program and co-directs the Organic Weapon Arts Chapbook Press and Video Series with Jamaal May.